If you’ve ever bouldered here at EVO (or frequented the old Maine Rock Gym), you’ve probably crossed paths with our newest full-time team member, Trevor Bostic. 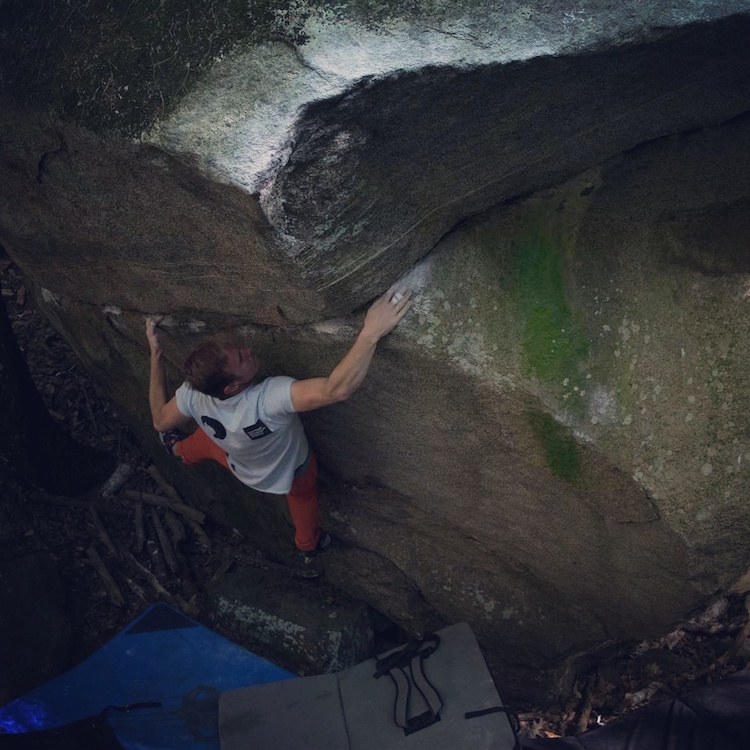 Trevor is a passionate climber and all around swell guy that has been a part of the EVO community from the beginning and we are psyched to have him on board! I recently sat down to chat with Trevor to learn a little bit more about him, his climbing career, and his future plans. Here’s what he had to say. I started climbing my senior year of high school which is going on ten years this year. A friend of mine took me and I was hooked *snaps fingers* instantly, it was like I just loved it, it was so much fun! 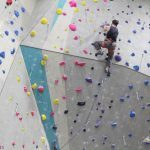 We’d drive down from Brunswick and go climbing at the Maine Rock Gym, and when I went to school in Boston I continued my love of being a gym-rat and discovered the crazy gyms there. My love continued to grow and I found outdoor climbing and yeah, here we are today. I couldn’t escape it, I think it’s the perfect mix of a puzzle and a physical challenge. That’s awesome, you’ve been with EVO since the beginning! 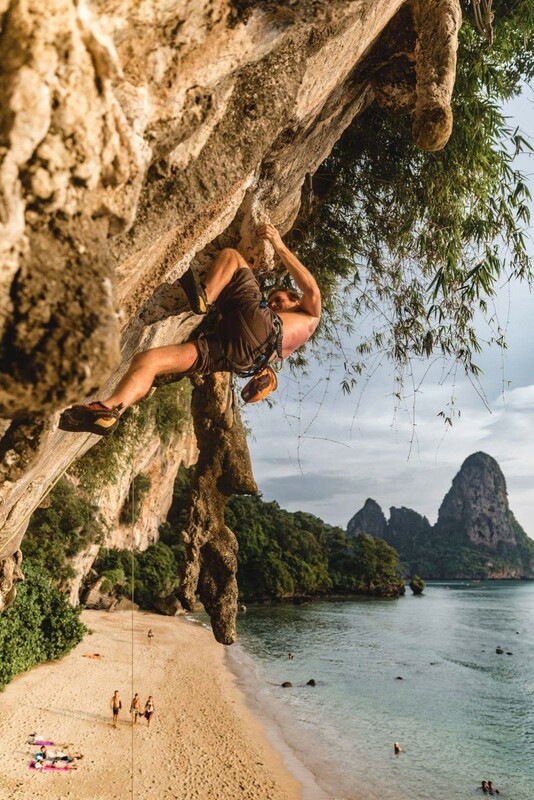 Where did you first climb outside? 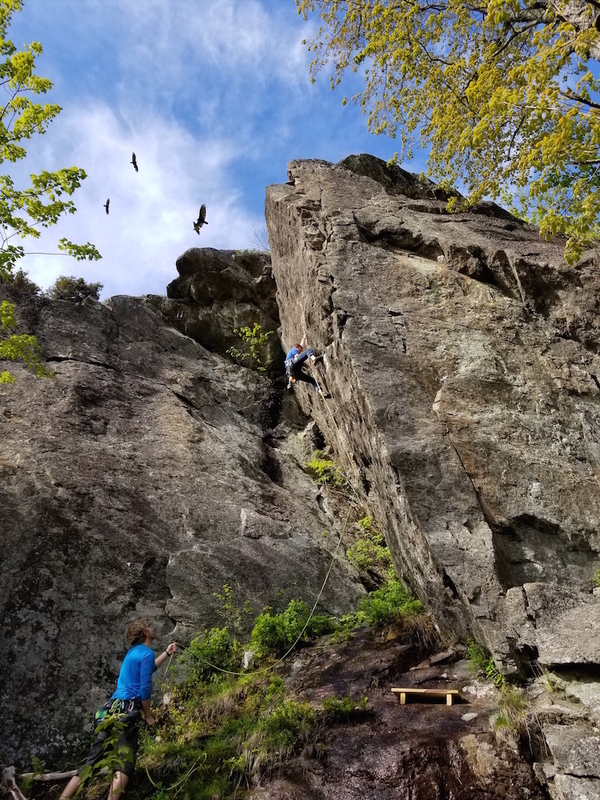 I think the first time I climbed outside was at a place in Boston called Hammond Pond, I was very quickly humbled by the real rock and the sharp holds and the high top-outs, as I think most gym-to-outdoor climbers would be. I definitely feel that. 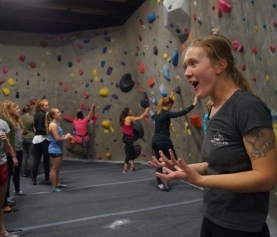 So you started out bouldering? Yeah, I always liked bouldering a lot, I find it to be more of a jovial experience. 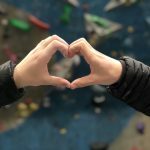 It reminds me a lot more of being like a kid on a jungle-gym, whereas ropes is more rewarding, I think, in the long run but it’s more of a mission; you have a goal, and you have to set up and prepare for your goal. It’s just different. What would you say you do more often now? Oh, I definitely boulder way more! 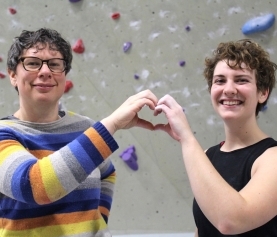 I think that bouldering translates to sport-climbing quite well because if you’re powerful you can do the moves with ease, whereas being a great sport-climber doesn’t translate to being a great boulderer. So, if I’m going to pick one, I’m gonna pick bouldering. It’s also easier to do if you don’t have a partner. Truuue. Where is your favorite place that you’ve ever climbed? Obviously, Thailand was incredible but that was a sport climbing trip and I’m much more of a boulderer. So when I think of places that I’ve been that just kind of rocked my socks, I keep going back to Red Rocks, just ’cause the amount of rock that was there was inconceivable. 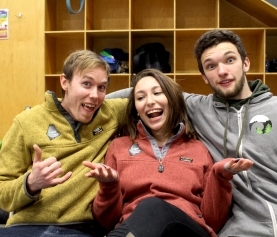 Like, lifetimes and lifetimes, pick whichever discipline you want, do you wanna climb trad? You wanna sport climb? You wanna boulder? Go there, there’s so much of it. I definitely can’t imagine not going back there. As mentioned, your most recent expedition was to Thailand, tell us a little bit about that. 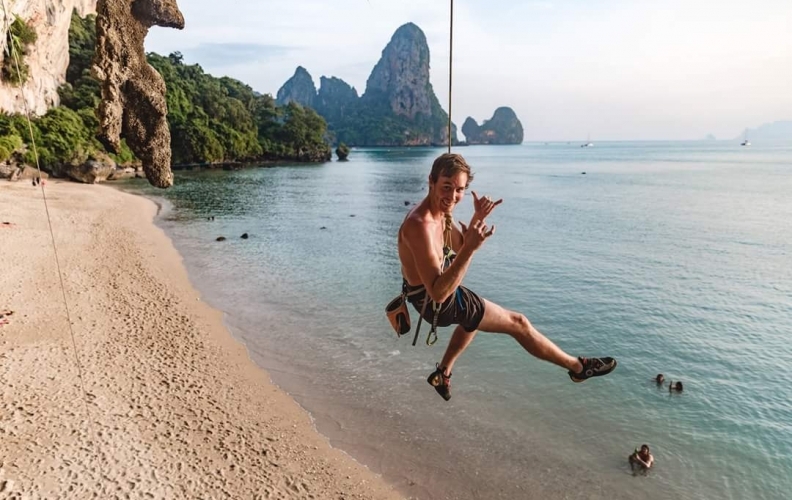 Thailand was like a climbers’ paradise really, it was right on the beach, it was super high quality climbs on beautiful streaked limestone, super aesthetic, three dimensional climbing, weird knee bars, surrounded by monkeys. The hardest part about it was, I’d say, everyday we were climbing in 80 to 90 degree heat, which is hot. You didn’t have a choice there, you just had to make it work, which mostly meant I didn’t climb a lot of slopers, it was mostly pretty decent holds. But it was so much fun, just hanging out on the beach with a crew of international climbers, climbing your heart out and then going to the bar afterwards. It was great. Do you have any future trips planned? I’m hoping I’ll get to go, here in the next month or so, to Chattanooga, TN and get out of the horrid weather we’re having around here and climb with some old gym patrons. What’s your dream climbing destination? Oh, probably the Rocklands. I’d have to pick, you got some of that tropical vibe going on, it’s bouldering, the rock there just looks so beautiful. I’d say Australia, the Grampians, would also be up there as well but they have some gnarly snakes and I’m pretty scared of snakes so, I’ll take that one with a grain of salt. What is the hardest part about climbing? Not thinking too much, not getting in your head. I think we’re our own worse enemies as climbers and it’s really easy to look at something and say “I can’t do that” or get on a move and say “I’m too pumped.” But really that’s part of the beauty of climbing, I think you do best when you turn your brain off and try as hard as you can, to really give yourself entirely to the present. Do you have any advice for the new climber? Sure, I mean just follow your psych, whatever that is, whether it’s ropes or trad or bouldering and just keep climbing. Climb a lot. A lot of people get very focused on these training plans and how to get stronger and all this stuff when they just start out. If you haven’t been climbing for years and you haven’t hit a plateau, and I’m talking a plateau where you don’t get better for a year or two, not because you’re not climbing but because you literally can’t figure out how to get better, that’s when you start training. That’s when you hit the campus board. That’s when you submit yourself to these horrible training regimens that can be very mind-numbing. Until then you’ll get better by just spending more time climbing , a lot better, and that’s the best thing to do, I think. Climb more. Awesome. Is there anything else you’d like to add? Be good belayers. Be present. Use a GriGri if you can. Be good belayers, that can’t be under-stated. It’s an art form, practice it, get better at it, people will appreciate it. Thank you for sharing the stoke, Trevor!